As reported in the Daily Mail,1 a Dutch judge ordered the killing of an 80-year-old woman with dementia, after her doctors insisted she was not capable of such a decision. The woman’s family asserted she had a ‘death wish’ and wanted to die. The day after this decision was handed down, the judge’s orders were carried out. This elderly woman was taken to the Life End Clinic and killed by lethal injection. The same article gives details about the rise in the number of deaths by euthanasia in the Netherlands. The latest available official statistics give 4,188 deaths by lethal injection in 2012 followed by 4,829 in 2013. The reports do not include terminal sedation, where patients are administered lethal doses of drugs such as morphine. If added to the official totals, euthanasia then accounts for 1 in 8 deaths in the Netherlands. Unfortunately, nations around the world are considering following the lead of the Dutch. ‘Right to die’ legislation and judicial decisions2 striking down laws prohibiting the practice are on the rise worldwide. It’s less expensive for the healthcare insurance provider if the 80-year-old dies, rather than to keep paying for days or weeks of hospital stay and medical treatment. The inheritance can be divided, and there will be more of it, if Uncle Charlie just ends his life rather than maintaining his expensive prescriptions and medical care. Promoters of assisted suicide brush off such attitudes. However, pushing this supposed ‘solution’ goes hand in hand with a utilitarian mindset. Money becomes the master in our relationships. When costs add up, suddenly a shortcut to death provides a way out. Why prolong the inevitable? More money won’t bring a cure, after all. Because of this, euthanasia follows as a natural consequence of assisted suicide legislation. Instead of individuals deciding to end their own lives, family members and panels of doctors can do so. The value of a human life now comes down to a measure of dollars and cents. Conspicuously absent from the debate over ending one’s life is the notion of suffering. Yes, we hear so much about wanting to end pain, about stopping physical and mental anguish under the guise of “mercy.” What is never talked about is the value of suffering. Reading the previous sentence can throw a modern mind into confusion. The value of suffering? How can pain and anguish ever have value? To understand this necessary concept, we must first let go of our selfishness. When we suffer, especially when we suffer well, it is an inspiration to those around us. Picture the war veteran who bears his wounds with dignity or the housewife with cancer who sacrifices for her children. Through their unselfish example they become beacons of light in today’s dark world. Future generations learn the valuable lesson of not giving up on life when we accept life’s pains with seriousness. When Our Lady appeared at Fatima in 1917, she asked that we offer up sufferings for the conversion of sinners. What better way can we spend our lives, knowing what we endure can help save souls from hell and attain heaven? No solution for our society, at any point in life, can be found apart from embracing the cross. Robbing man of the ability to carry their cross to the end becomes the ultimate injustice. 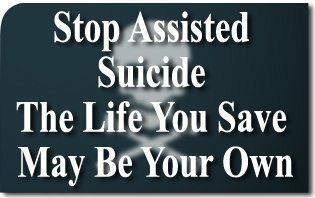 With this in mind, we must oppose all efforts to promote assisted suicide and euthanasia. As we carry our crosses through life, we can inspire those around us. Better still, we can help save lives from eternal perdition. In working to stop these attacks on human life, the life you save—yes, even eternal life—may be your own. This entry was posted in Catholic Perspective and tagged assisted suicide, embracing the cross, eternal life, euthanasia, human life, suffering by Ben Broussard. Bookmark the permalink.